PD Adapt and PanTech Design are proud to announce the release of the latest version of their revolutionary Adapt Suite. Available for immediate download, this version continues the tradition of innovation with one of the most ground-breaking features since the initial release of the Adapt Suite, Dynamic IR. Traditional Crestron programming requires a skilled programmer to modify infrared (IR) controls for common devices such as televisions and Audio/Video receivers. This process is time consuming and expensive. With the introduction of Dynamic IR, Adapt further simplifies the process of programming this type of control. In fact, Adapt Dynamic IR takes IR control completely out of the complex Crestron programming environment and puts in the hands of field technicians, enabling them to create, modify, and load IR control without the need for a programmer’s assistance. 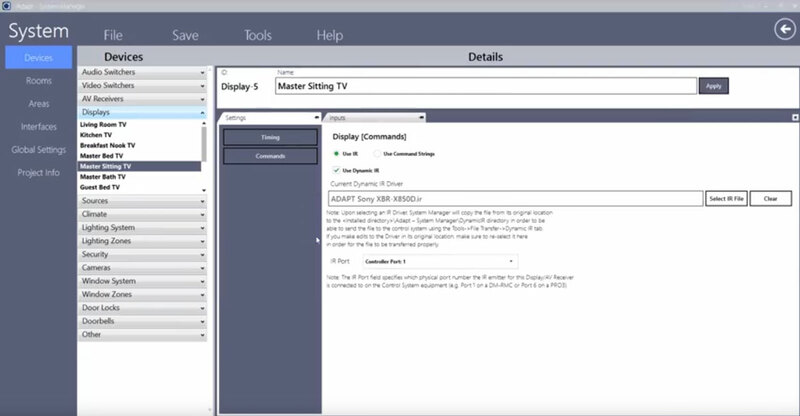 Designed for “non-programmers,” Adapt’s System Manager application furthers a technician’s autonomy by enabling them to address problems and changes during installation and commissioning of a Crestron automation system. Troy Morgan, founder and President of PanTech Design, commented, "Dynamic IR is a quantum leap in our continued effort to make Crestron control systems more accessible and profitable." Also within the Adapt Suite release are new features including enhanced multi-room audio control and keypad customization. Many Adapt SIMPL Windows modules have also been expanded to allow programmers greater flexibility to customize and integrate third party interfaces like Amazon Echo voice control. Adapt is a revolutionary set of software tools designed to simplify programming for Crestron home automation systems. It includes a suite of SIMPL Windows modules, user interface templates, and the Adapt System Manager application which enables simple configuration and customization of Crestron control systems. Introduced in 2015, Adapt has already been adopted by more than 60 Crestron programmers and deployed in over 300 homes around the world. PD Adapt is a Crestron Certified Integrated Partner and currently the only software based, programming tool in the prestigious program for Crestron manufacturing partners.